TORONTO, Sept. 27, 2018 /CNW/ - Students in Niagara College's one-of-a-kind Commercial Cannabis Production (Graduate Certificate) program are going beyond theory and getting their hands dirty, after the program's first cannabis plants arrived at the College's Niagara-on-the-Lake Campus last week from its partners, Up Cannabis Inc. ("Up Cannabis"). Fifty plants were donated to the program by licensed producer Up Cannabis, which operates a flagship greenhouse facility in the Niagara region and is a wholly-owned subsidiary of Newstrike Brands Ltd. (TSX-V: HIP). Students will gain real-work experience growing and managing the plants, which are just two weeks old, from the earliest stages of growth all the way to harvesting and curing. The plants will also allow students to experiment with nutrition, environment, lighting, climate control, pest control and cultivar selection techniques, and conduct small applied research projects as part of their studies. Since the program began in September, students have been learning some of the theory related to the cultivation and growth of cannabis, in preparation for the arrival of the plants. "Now that the plants are in, we get to put what we've been taught into action," said Commercial Cannabis Production student Elizabeth Foley. 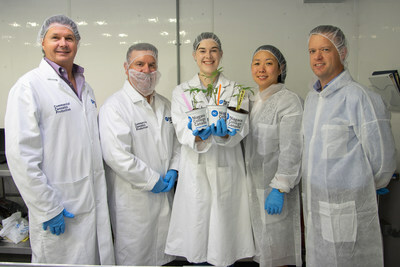 "We'll get to see each stage of the plant's growth right before our eyes, which is amazing – it's so hands-on. I'm excited to see how they turn out." The donation is part of an ongoing partnership between Up Cannabis and Niagara College that will also see internship and on-the-job learning opportunities for students at Up Cannabis' Niagara Facility in Beamsville, Ontario. "This partnership and donation illustrates that Up Cannabis is genuinely invested in our industry—from the ground up," said Jay Wilgar, CEO of Up Cannabis and its parent company, Newstrike Brands. "We are pleased to contribute to the formal education and skills training that has quickly become critical for the entire cannabis industry. We are going to need individuals with the skills that this program will produce, and we are therefore thrilled to play a direct role in this historic new program." The plants will be housed in Niagara College's purpose-built teaching lab at the College's Niagara-on-the-Lake campus. The teaching lab serves as the home for the Commercial Cannabis Production students, and replicates the equipment, facilities and practices that modern licensed producers of cannabis employ in Canada. The lab, which is constructed from modified shipping containers, also conforms to the strict security requirements that govern these facilities under Health Canada's regulations. "Partnering with industry leaders like Up Cannabis to provide hands-on experiences for our students is a hallmark of Niagara College's unique approach to applied learning," said Vivian Kinnaird, NC's Dean of Business, Hospitality and the Environment. "Ongoing collaboration with key players in Canada's cannabis industry has helped ensure our students will graduate job-ready, with the skills and experience needed to lead Canada's cannabis industry into the future." As the College has obtained an exemption licence from Health Canada for education and research purposes, under its current regulations, cannabis grown in NC's facility will not be used or sold. Sample analysis will be conducted in a third-party lab to assess growing and quality control practices, and the plants will be destroyed on-campus. Niagara College offers more than 130 diploma, bachelor degree and advanced level programs; as well as more than 600 credit, vocational and general interest Part-Time Studies courses. Areas of specialization include food and wine sciences, advanced technology, media, applied health and community safety, supported by unique learning enterprises in food, wine, beer, horticulture and esthetics. For more information, visit niagaracollege.ca.